Before putting a bit in a colt’s mouth for the first time, desensitize him to it to take away any defensiveness he might have about the new piece of equipment. 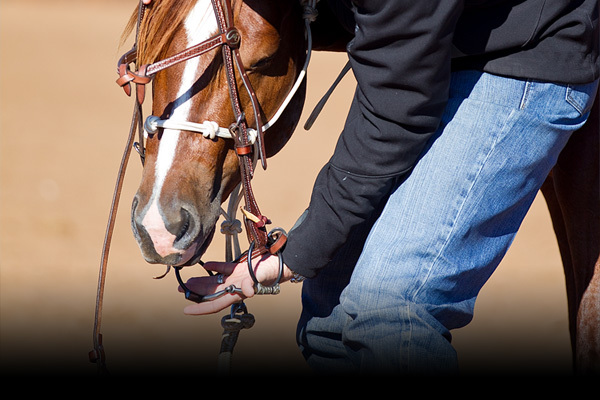 The biggest mistake people make when trying to put the bridle on for the first time is a lack of preparation. Too often, the colt is still a bit head shy – he’s worried about your hands coming up near his face, or he’s unsure of the bit. If you don’t prepare the colt, what ends up happening is you’ll have to chase the colt’s nose to get the bit in his mouth. Then, when you finally do get it in his mouth, he’ll throw his head up in the air when you go to slip the headstall behind his ears. Then the bit either falls out of his mouth, or it hits his teeth and scares him, which makes him think it “bit” him. Then he’ll back away from it and get wary every time you try to bridle him. You don’t want that to happen, so spend the time necessary to prepare the colt for the experience.